DENVER, CO--(Marketwire - March 8, 2011) - Amid a growing controversy over the accuracy of national housing data, Patricia Bybee, President CEO of Metrolist, Inc. (http://www2.metrolist.com/default.asp?page=company_overview), is encouraging the industry to keep its focus on the reliability of local data. At issue is the perceived accuracy of what's widely considered the most popular measure of existing home sales, the National Association of Realtors' (NAR) Existing Home Sales, specifically that the report has increasingly overstated home sales. The NAR has dismissed claims it could dramatically mis-report national sales numbers. "We appreciate, of course, the conversation around the NAR's data," said Ms. Bybee, who's been at the head of Metrolist since its founding in 1984, "but we've no insight into its validity. The fact is, realtors focus on local data anyhow. And about that we're entirely confident of the accuracy." 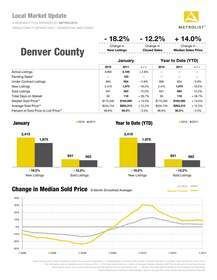 Ms. Bybee's firm, the only real estate Multiple Listing Service (MLS) serving the entire metro Denver area and one of the first regional multiple listing services in the nation, provides a broad database of real property listings for real estate brokers to serve buyers and sellers. Metrolist's 'Monthly Indicator Report' highlights key metrics and provides a top line summary of the month's trends. Similar to other ready-made, localized reports produced around the nation, the firm's 'Local Market Update' gives a historical view of how prices have changed in that area and in comparison to the overall market. "At the end of the day, realtors are the real voice of real estate," says Ms. Bybee. "Regardless of what's right or wrong with NAR's data, the fact remains that local data is more relevant." Metrolist is the largest MLS in the state of Colorado, supporting the largest network of REALTORS® with the most comprehensive database of real property listings throughout the Front Range. REALTOR owned since 1984, Metrolist provides leading technology solutions to real estate agents and brokers to better serve buyers and sellers. More information about Metrolist is available at www.metrolist.com.